This workshop will look at what's happening in the Caribbean and how climate change and the global financial system interact. We will also explore what action can be taken from Ireland to push for debt justice for countries like Heron's, before the 2019 hurricane season hits. Friends of the Earth Book Club – "Climate Generation"
Limited Places: Book your seat now. To launch the Friends of the Earth book club, we will be joined by Lorna Gold, author of ‘Climate Generation – Awakening to our Children’s Future’ for a public conversation about the roots of her activism and balancing fear and hope for the future. 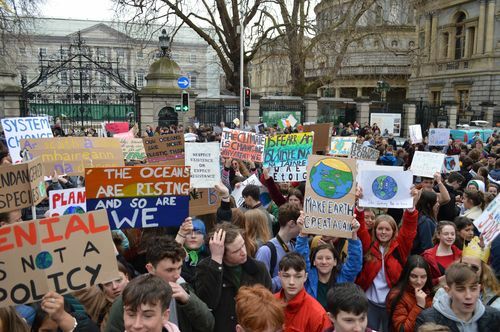 I’m really delighted to announce now that we will also be joined by some of the inspiring young people involved in the growing school strikes climate movement, for a broader discussion about the way youth activism is shaking up the politics of climate action. If you didn’t make it to any of the strikes for climate last Friday, I’m sure you caught some of the action covered by various media sources (see below). Watching from the side lines, I felt a real sense of that something new was happening. Something that could have the power to tip the scales towards action, seeing students join forces across different schools around the country make a stand, with one clear message – our leaders are not doing their job. These young people’s future is at risk because of our government’s failure to act, and they are not going to stand idly by. As you know we asked our supporters to chip in to cover the cost of the stage and the sound system for the Dublin rally. Those costs amounted to €1050. We’ve raised €700 so far, thank you so much to those who donated. If 35 of us chipped in €10 we’d have the rest covered. Sign up to join the action here at this link. One year on from the nationwide action on supermarket plastic packaging, the Sick of Plastic campaign is launching its local groups platform so you can mobilise your community and organise your own actions. This next wave of action is not just about one big day of action. Supermarkets are not responding fast enough to customer demands so we need to keep these actions going on a regular basis. The Sick of Plastic local groups platform makes is really easy for you to organise your own actions, whenever and wherever suits you. To grab supermarket’s attention and keep the momentum going, we’re asking all local groups to organise their first shop and drop on April 13th. Join or form a Sick of Plastic local group in your area here at this link. Let’s keep the pressure on until supermarkets #BreakFreeFromPlastic. That’s all for now, I hope we'll see you at one these events coming up. P.S. Here’s some more national media coverage of the climate strike. Thanks for helping to give the youth climate movement a platform, literally :-).